What size trampoline should I get? What separates your company from the rest of the competitors? How do I know if I need a Round Trampoline or a Rectangular Trampoline? What do I look for when buying a Trampoline? What cover should I get? What is the difference between a PVC cover and a PE cover? Can I jump on my trampoline when a Trampoline Tent is installed? What are your pads made up of? What are your mats made up of? Why can’t I get the same trampoline from a big DIY store, catalogue company or the ones I've seen it on the internet at the same price as your Happy Trampoline products? Can the trampoline be taken down for storage? Getting the right trampoline size to enjoy for many years is very important. Consider the users and their growth in 2-4 years. A 14' trampoline has 44% more jumping area than a 12' trampoline. We understand the importance of safety when it comes to children. We come from a large family with lots of small children so we appreciate a customer who expects only the finest quality. We are proud to say that we have the strongest heavy duty steel frame structure in the industry! Because we’re so confident in our product, we’ve backed it up with a lifetime warranty. This alone separates us from the rest of the competitors along with FREE shipping and spectacular customer service. If your kids are active in tumbling and gymnastics and/or you want the "very best bounce" from a trampoline, then by all means, go with a rectangle trampoline. By design, a rectangle trampoline will give you the highest bounce of any trampoline. 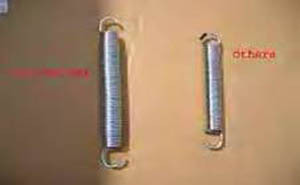 The springs on a rectangular trampoline work at different rates giving a quick response, resulting in a more powerful lift. This makes it more suitable for gymnastic use. However, because of these characteristics, rectangular trampolines should only be used by one jumper at a time. A rectangle trampoline does not have a "center" spot, therefore, does not control your bounce, putting the jumper back into the center of the trampoline. This allows the jumper full control of the placement of their jumps. The long straight sides allow the jumper to do tumbling routines with ease. A rectangle trampoline is great for gymnastics and cheerleading routines. On round trampolines, all the springs work at the same rates giving an even, softer, and more stable bounce, suitable for children of any age or ability. 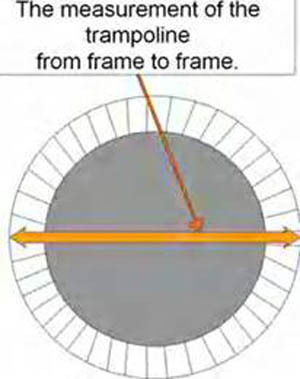 A round trampoline has a "center soft spot", therefore, tend to control your bounce, putting the jumper back into the center of the trampoline. Round trampolines at the higher end are all suitable for adults. A Trampoline Enclosure is highly recommended with any aggressive jumping routine or inexperience jumping to help prevent uncontrollable jumpers from bouncing off the trampoline unit. A Quality Trampoline Frame: The most important part is a good quality trampoline frame. The thickness of the metal, the size of the pipe and the quality of the welds will cause the trampoline frame to last longer. Always ask for the heavier gauge. The lower the gauge number, the thicker the steel. Most competitors offer trampolines from 17 gauge or 16 gauge. Note: The gauge gets thicker as the number goes down. A Good Trampoline Mat (or Bed): Ask for Grade A Permatron. Make sure the threading used is UV treated and heavy duty. Make sure the attachment used is v-rings. All of our trampolines are excellent quality with 6 rows of stitching that holds the v-rings securely in place. Our mats have an extra lining to hold the v-rings together. Below is the picture of Happy Trampoline’s mat compared to other mats. 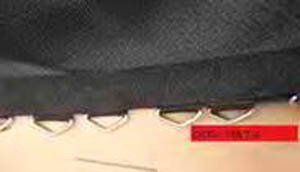 Compare the stitching that holds the v-rings together. Trampoline Spring: It's not just the length and it’s not just the trampoline spring count that gives you the best bounce. It's the resiliency (the recoil) of the spring. All of our trampoline springs have a resiliency that is designed for a fantastic bounce! A Thick Trampoline Pad: Make sure it’s thick enough so you don’t feel the trampoline frame underneath. You want to have good quality vinyl and polyethylene foam. We recommend that your trampoline pad be at least a 1/2" to 1" thick. Thick pads are well worth the extra cost. Don't settle for LESS!! Accidents and injuries can and do occur from hitting the springs or frame. Our trampoline pads are built to last. They are made of long-lasting PVC-vinyl material on the top and closed-cell foam inside. Our pads will not absorb water, mildew or lose shape. What is a Trampoline Enclosure/Safety Net? A safety net that surrounds the trampoline preventing jumpers from falling off during jumps. It is a safety equipment for children and beginners. Although no device can guarantee your safety and safe play remains your responsibility, our enclosure does substantially reduce the risk of injury associated with falling off a trampoline. Studies have shown that most trampoline accidents occur without the support of a trampoline safety enclosure net. Our trampoline pads are built to last! They are made of long-lasting PVC-vinyl material on the top and closed-cell foam inside. Our pads will not absorb water, mildew or lose shape. All of Happy Trampoline pads exceed all national ASTM standards. We offer a full 5 year warranty on our PVC pads. Please refer to the warranty section for details. What are your mats made of? The mat is made of an industrial fabric called Permatron. Permatron has been the choice of trampolines for decades. It is specifically engineered for trampolines and rebounders. It is constructed with polypropylene loaded with carbon and features extremely high tensile strength, UV protection, and mildew resistance. Permatron can hold up in the most extreme climates and resists weather conditions such as precipitation and sunlight. It is flexible, but does not stretch. It will provide a firm and stable surface, yet is supple enough to cushion joints. 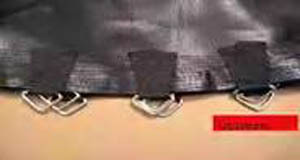 Permatron does not crease or fold and will always return to its original flat condition. This unique process for manufacturing Permatron has been time tested for over 20 years. These methods lead the industry in producing the best trampoline fabric. It’s not the same. Quality, specification, warranty, design, service are night and day. The price might be similar. But have they documented all the specifications and warranty like the way we do? Or does it just say (safety pads, trampoline can be left out doors all year, etc.). Are their steel frames as thick and durable as ours? What type of gauge do they have on their steel? What type of resiliency do they have on their springs? Ask for the detailed specs similar to the ones we display. No, they are very easy and the frame just slots together. It will take approximately 30 to 45 minutes the first time you assemble. Big round trampolines cannot fold by design. You can take it apart, but it’s not something you will want to do often, as it will take approx 30 minutes each time! Happy Trampoline products has a lifetime warranty on the frame and springs and 2 yrs on the jumping bed and frame pad. See our warranty page. We urge you to compare our warranty to our competitors!